By Wesley W. Whitmyer, Jr. I have been asked this question hundreds of times. You can probably guess that the person doing the asking has just been accused of patent infringement. What you probably can’t guess is that the person doing the asking either doesn’t know that much about patents, or doesn’t have a very effective patent program at his company. This article imparts actionable knowledge about using patents to help your business gain market share and pricing power. I’ve represented companies of all sizes for nearly 30 years on patent issues. An inventor myself, I have licensed my own patents to companies around the world for millions of dollars. Here is my guide to obtaining valuable patents. I coined the term “Invention Hunting” because it reinforces the fact that anyone can invent. Inventing can be taught, and it should be taught in your company. The act of invention is not a passive pursuit. Inventors don’t just ruminate until struck with lightning bolts of genius. They don’t have proverbial light bulbs go off in their head. Inventors don’t need to be geniuses. Inventors only need to have energy and know where to look. The place to hunt inventions is in the market space your business wishes to occupy in 10 years. Patents on these inventions will have intrinsic value because they inherently protect your business strategy. Invention is a collaboration between your marketing and product development staff. Technical sales and customer support staff can also provide valuable input. All of these parts of your company should develop a list of customer complaints, and feature wish lists for your product or service. What do customers like about your product/service, and what feature(s) do they wish it had? Solving these problems and providing these features is also inventing. No question Apple carefully studied the BlackBerry Quartz before they staked out their market space: camera, color graphics, touchscreen and WiFi. Next they focused on the technologies that could provide the feature set they had identified. How to pack a desktop monitor’s worth of screen resolution in a pocket-sized phone? And all this on a touchscreen with a magical keyboard that pops up when needed. How do you operate the iPhone without the many keys and buttons found on the BlackBerry? How do you combine WiFi and cellular connectivity in a single device? The touchscreen construction, in particular, likely required conquering many technological hurdles. Beyond technology, the iPhone accelerated User Experience design or UX. UX concerns defining how gestures are unambiguously interpreted by the device. For example, the touchscreen had to interpret new kinds of interactions that went well beyond simple point and touch selection. 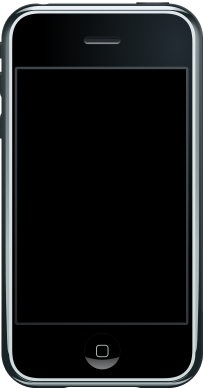 Touches such as single finger swipes eg to unlock the device and multi-finger gestures such as pinch to zoom also had to be interpreted by the screen. This UX language was very important to the iPhone market space because any mobile phone with a touchscreen would be dependent upon it. Not coincidently, Apple’s patent strategy included protecting its UX. If Apple could put a patent fence around its UX, it could force competitors to adopt a new UX language which would befuddle customers and thereby discourage them from switching to competitive products. 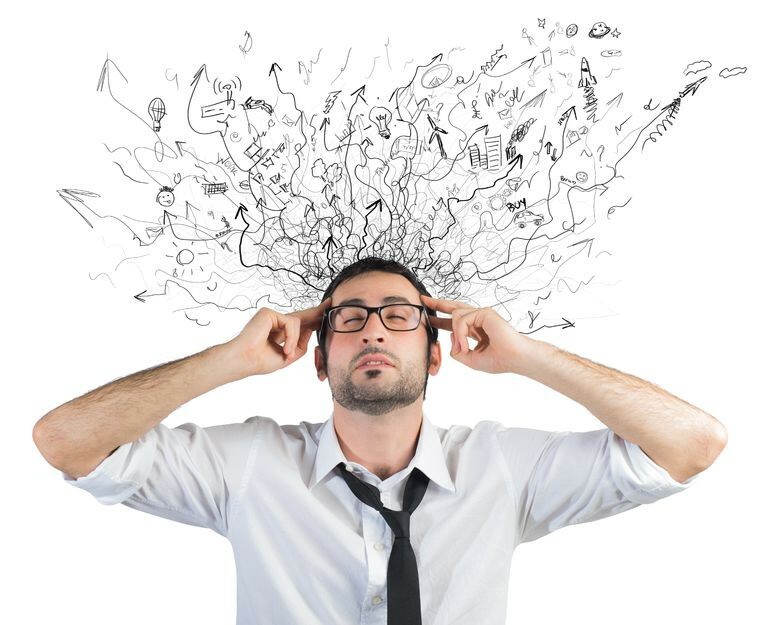 The rules and laws applicable to patents are extremely complex. Nonetheless, the job is made much easier and result likely to be much more valuable to the owner once the above three steps are completed. The patent attorney’s job is to build a word fence around the inventions identified in the market space of interest for the company’s goods or services. Once the patent attorney understands the market space and business strategy which gave rise to the invention, she is much more likely to build an effective word fence. Information about the competitor’s product and features can also be important so the word fence can be built right up close to these known products, making it much more difficult if not impossible for the competitor to innovate. 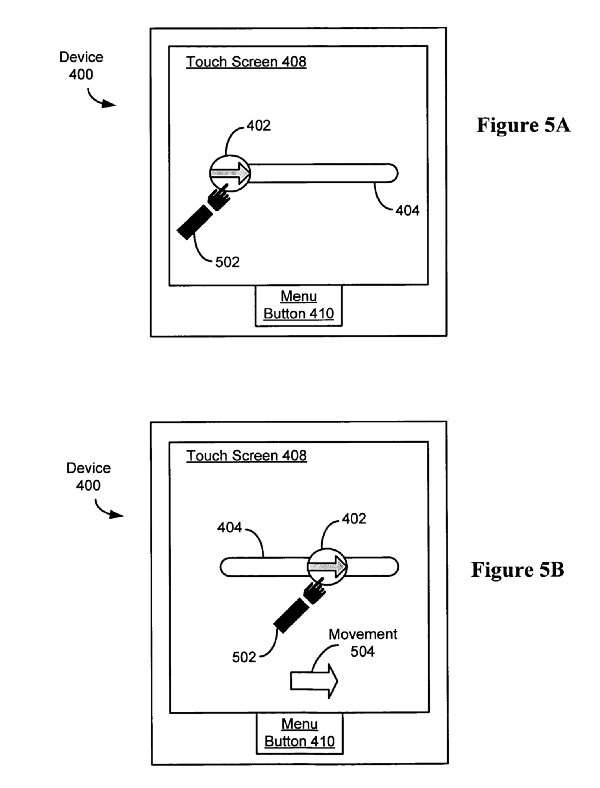 Figures 5A and 5B from US Patent 7,657,849.
maintaining the device in the user-interface lock state if the detected contact does not correspond to moving the unlock image across the touch-sensitive display according to the predefined displayed path. The related patent figures give meaning to the claim elements and illustrate how simple the patent really is, and how precisely it is aimed at Apple’s intended market space for the iPhone. A properly focused patent program won’t help you sell products, but it will help you protect your market space if your product is successful. Apple successfully enforced this UX patent against HTC mobile phones using Google’s Android operating system. This and other patents have certainly helped Apple grow its market share, and improve its pricing power. As a final point, it’s important to understand that the process outlined in this article is iterative. In other words, with each new iPhone the same steps were followed and new patents filed as Apple’s market space was redefined and features were added to its product. If this seems like an excessive amount of effort to put into your patent program, it shouldn’t. Patents are expensive but can be invaluable to your business if properly implemented. I have given this same advice to all my clients, and used it with my own patents as well. At Whitmyer IP Group, we are committed to solving IP problems in a creative and cost-effective manner. Our clients come to us for our superior technical and legal know-how and we leverage our skills with advanced cloud-based technology to obtain quality results.